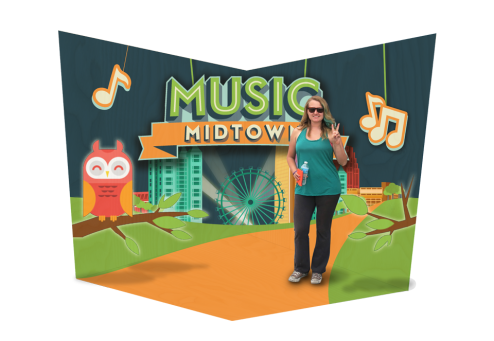 I led a team to create an interactive mural for Atlanta’s Music Midtown music festival. 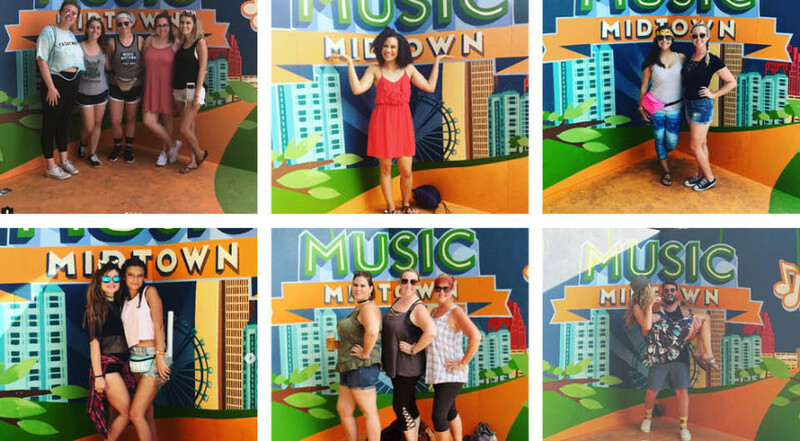 Music Midtown is a 3 day music festival in the center of Atlanta at Piedmont Park. It occurs every September; this year featuring big names like Bruno Mars and Blink-182. The music sets the mood but the real action happens around the festival. There is everything from food trucks, ferris wheel, beer gardens, lounge areas, games and more. 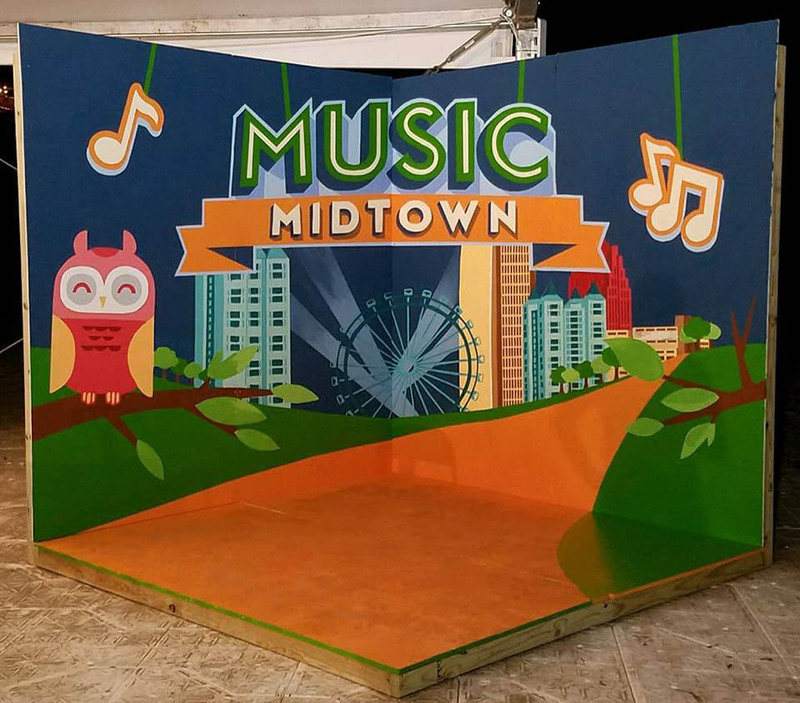 I had the opportunity to team up with a local event agency and activate the park with an interactive mural. The goal of the mural was to create a scene for patrons to pose inside of and share on social media. I would say it was overall a huge success and there was even a long line of excited festival goers posing with our mural. Once the mural was approved I stretched the image to be forced perspective. I recruited a few artists to help with painting and construction. Work was split into two teams. 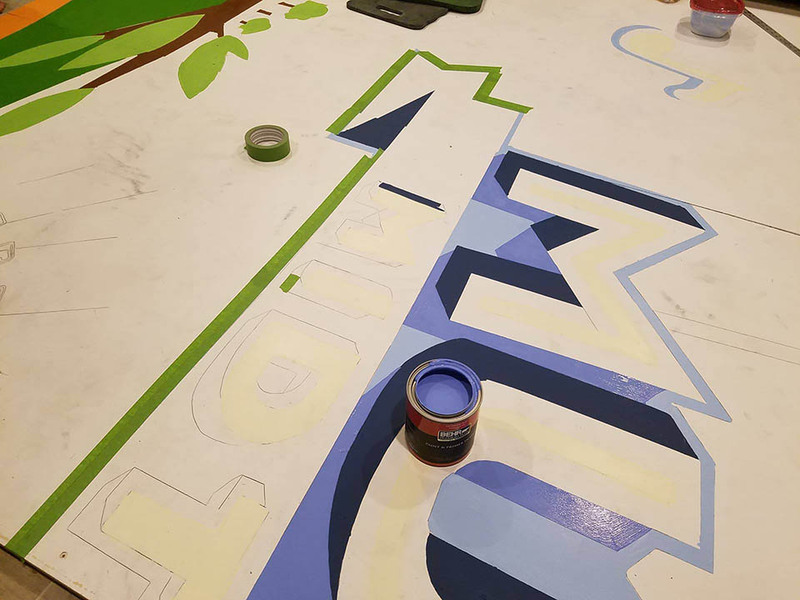 One team worked on taking the initial design and applying it to four 4’x8′ panels. The painting team was comprised of artists Chelsey Austin, Kristi Oakes, Sarah Reed and me. Kristi and Sarah were in town from Savannah, GA because of Hurricane Irma. But unfortunately they did not escape the storm! The project was quick turn around and we did not have time to spare. Between feeding my newborn and losing power we had quite the time completing this project. The power went out one night and we had to paint using a flashlight and candles. Jessi and Kristi drawing out sections of the mural to be painted. 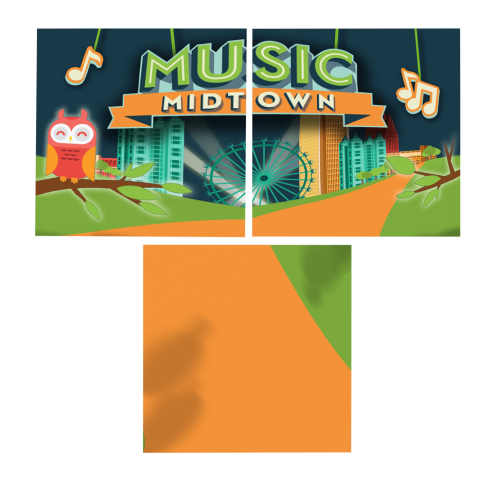 We color matched to get the exact blue color of paint and taped the edges to paint exact lines around the Music Midtown logo. 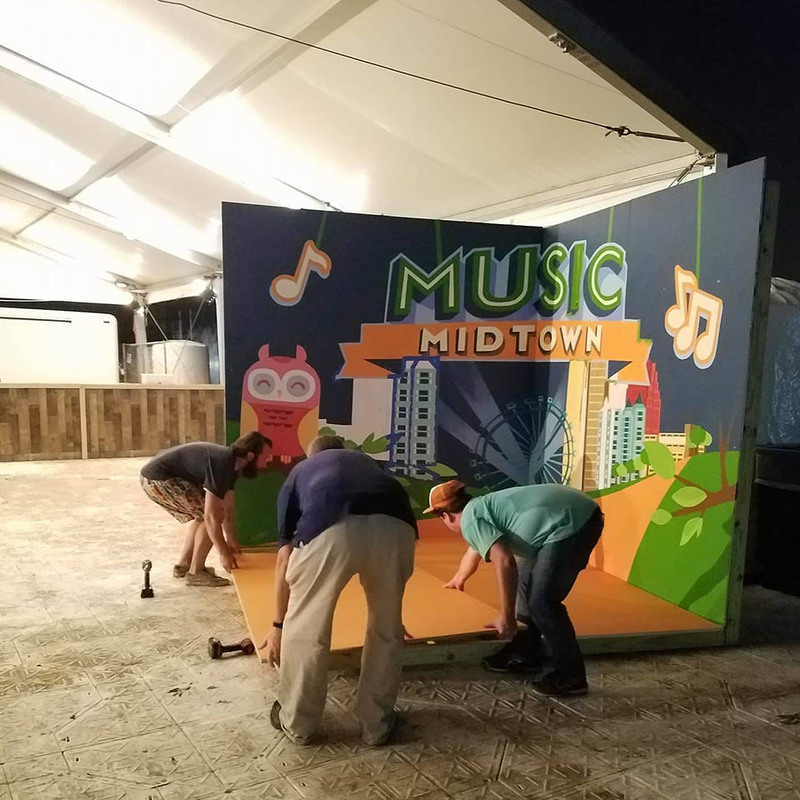 The second team was focused on building the structure which would hold the two 8’x8′ walls in place for the duration of the music festival without coming apart or falling down in the wind. 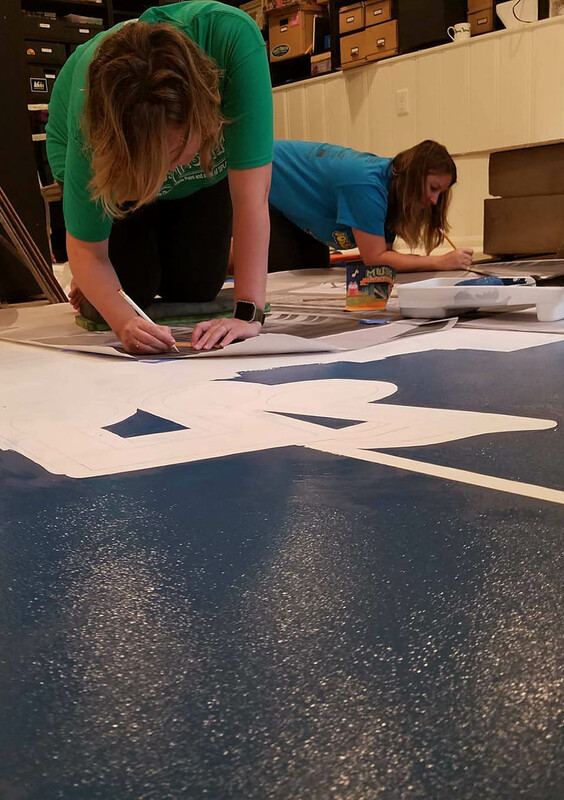 Zachary Herndon and Andrew Greene worked to get the design and build complete as quickly as possible so that the mural panels could be fitted and checked before delivery. The structure itself was modular and built to be transported. 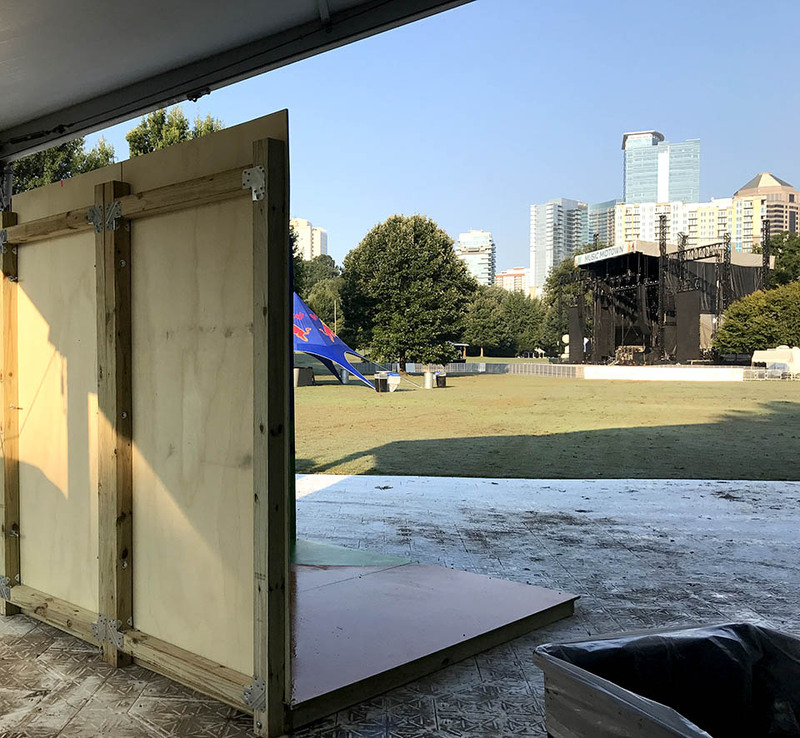 The frame construction was completed before the storm and it survived hurricane Irma so we knew it was good to go for Music Midtown. Final delivery included last minute touch ups to make the installation pop the weekend of the festival. Zach, Andrew and Josh assembled the panels on site the night before the festival. Our mural all set up and ready for the festival to begin.